LIMERICK FC STUNNED the champions as Danny Galbraith starred in a 2-0 win at Thomond Park. The Scotsman scored the opener before assisting Jason Hughes to secure the points with just ten minutes to go. In what was a poor first half of football, the Saints kept the ball well, although Limerick pressed well to deny them space through the middle. Their biggest threat came via overlaps from Ger O’Brien and Ian Bermingham. Kenny Browne’s header was about the best chance the Saints had in the opening 45, but despite Lee Lynch’s perfectly weighted ball into the box, Browne could only find the arms of Barry Ryan. Despite the visitors’ dominance in the possession stakes, it was the hosts who had the best chance of the opening half. Shaun Kelly found space on the right before crossing towards the back post. Brendan Clarke appeared to misjudge the flight of the ball and Shane Duggan spurned a glorious chance at the back post. His header went wide of the post despite Clarke being stranded. The Saints started brightly in the second half – Ian Bermingham fired a warning shot after cutting in. James Chambers’ pin-point ball set up the full back, but the effort fell short of what’s required to beat Ryan. Limerick would eventually go on to feel the strain after three games in a week – Liam Buckley’s men penetrated more than enough times to lead comfortably, but it was the home side who broke at pace and took the lead. Galbraith, who has pace to burn netted his first goal for the Club just past the hour mark when he raced clear. He shrugged off a couple of challenges before slotting confidently past Clarke to hand Limerick a surprise lead. The Scottish winger was not done there though – he raced clear, 10 minutes from time, despite the Saints pressure and squared for Hughes. 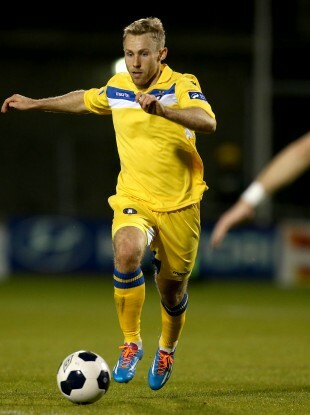 The Limerick native composed himself, took a touch and slotted past Clarke much to the dismay of Liam Buckley. Limerick secured their first win seven while the Saints failed to keep pace with Dundalk at the summit. LIMERICK FC: Ryan; Kelly (Whitehead, 81), Oji, Folan, Nzuzi; Hughes, Agyemang (McGrath, 48), Duggan; Tracy, Gaffney, Galbraith (McManus, 90). Subs not Used: Cusack, Leahy, Mann, Rainsford. ST PAT’S: Clarke; O’Brien, Hoare, Browne, Bermingham; Chambers, Fahey; Byrne, Lynch (Brennan, 66), Forrester; Fagan. Subs not Used: Gilmartin, Oman, Fitzgerald, McCormack, Kavanagh, Quigley. Email “Lowly Limerick make holy show of not so super Saints”. Feedback on “Lowly Limerick make holy show of not so super Saints”.